The Chubb Corporation, through its subsidiaries, provides property and casualty insurance to businesses and individuals. The company operates through three segments: Personal Insurance, Commercial Insurance, and Specialty Insurance. The company is member of the S&P 500 and the S&P Dividend Aristocrats indexes. Chubb has consistently increased dividends every year for 44 years. The company announced a 6.10% dividend raise in February 2009, plus a 20 million share repurchase initiative in December 2008. Between June of 1999 up until June 2009 this dividend growth stock has delivered an average total return of 3.90% annually. The stock is trading almost 50% above the levels it was changing hands a decade ago. 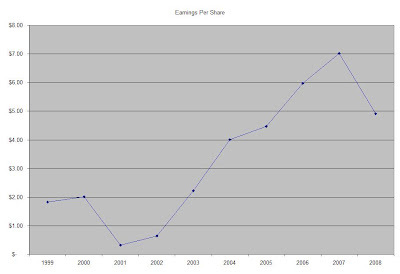 The company has managed to deliver an 11.60% average annual increase in its EPS between 1999 and 2008. Next year Chubb is expected to earn $5.15 share, followed by $5.20/share in FY 2010. The Return on Equity has ranged over the past decade between a low of 2% and a high of 20%. Rather than focus on absolute values for this indicator, I generally want to see at least a stable return on equity over time. With the exception of 2001 and 2002, this indicator has been stable. Annual dividends have increased by an average of 8.40 % annually since 1999, which is slower than the growth in EPS. The disparity is mostly due to a gradual decrease in the dividend payout ratio and the billions of dollars the insurer has spent on stock buybacks. An 8 % growth in dividends translates into the dividend payment doubling almost every four years. If we look at historical data, going as far back as 1984, Chubb has indeed managed to double its dividend payment every eight years on average. The dividend payout ratio has been on the decline, and is still much lower than my 50% threshold. 2001 and 2002 stick as outliers, since earnings per share were lower on high underwriting combined ratios. A lower payout is always a plus, since it leaves room for consistent dividend growth minimizing the impact of short-term fluctuations in earnings. Currently Chubb is trading at 9.20 times earnings, yields 3.10% and has an adequately covered dividend payment. In comparison rival Travelers Cos (TRV) trades at a P/E multiple of 10 and yields 2.80% , while Cincinnati Financial (CINF) trades at a P/E multiple of 8 and yields 6.40%. Berkshire Hathaway (BRK.B) is also a competitor to Chubb(CB), although it trades at a P/E of 29, and does not pay a dividend. The company does spend a lot of its cash flow on stock buybacks, which could prove beneficial in the long run since it could provide above average dividend growth over time for the same effort. I like the company and its business model. Insurance companies like Chubb (CB) are a way for investors to fill in the need for exposure to the financial sector, after several high profile payers like Citigroup (C) and Bank of America (BAC) cut their distributions. I believe that the company is attractively valued at the moment; thus I would be looking forward to adding to my position in Chubb (CB). - Why do I like Dividend Aristocrats? This article was written by Dividend Growth Investor. If you enjoyed this article, please vote for it by clicking the Buzz Up! button below.